(N)Migoto’s is a family driven cattery located in Oslo, Norway. The cattery was started in 2006 when our first Norwegian Forest Cat, SC (N) Lindbrekka’s Steffi from Vigdis and Lars Nordvik, arrived at our house. Over the years, the cattery has grown to become a very successful one. Our kittens are well-known for their social and excellent temper – making them perfect for both breeders, exhibitors and families looking for the perfect pet. Our kittens regularly meet children of different ages, as we always make sure that the kittens grow up with lots of humans and activity around them from day one. It is important for us that all our cats are part of our family, and that they walk as freely as we do around the house. Therefore, we always make sure our cats have lots of space to move around and about on, both inside our house and outside in our secure cat-run. Over the years, the cattery has grown a lot – but our philosophy has always been that there is a limit to how many cats a family can take care of at once. We are therefore very lucky and grateful to have many of our cats living as host cats in families nearby. They are a part of our cattery, as much as the cats living in our house, but is taken care of and lives with other families. 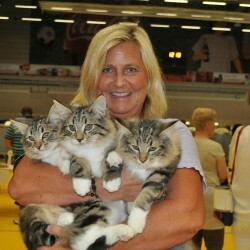 Eva Dahl Eide is the main person behind our (N)Migoto’s Cattery. She makes sure our cats stay healthy and happy, and always finds the perfact home for our kittens.